Located at 220 Lake Laurel Rd. From the Baldwin County Courthouse, go east on Hancock St. and follow Highway 22 (Sparta Hwy) east for 2 miles. Turn left on Lake Laurel Road. Go 1.1 mile on Lake Laurel Road. Stop at the gas tank plant (on right). 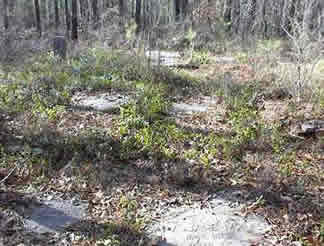 On the left side of Lake Laurel Road, directly across the road from the gas tank plant, and near the pavement is a clearing which houses the 5 marked and some unmarked graves of the Lattimore Family Cemetery. 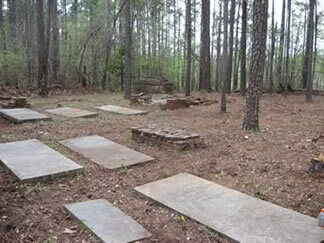 The Moran graves are located approximately 200 feet behind the Lattimore graves. 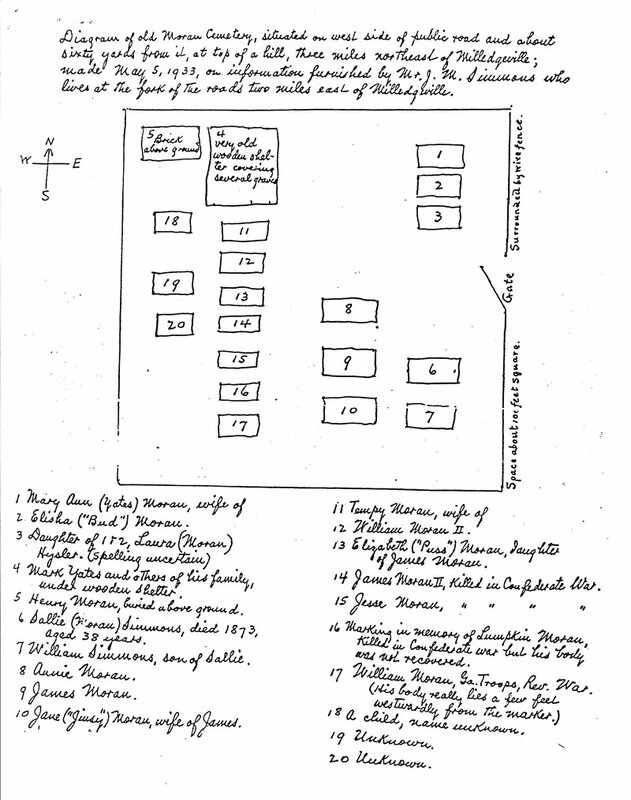 Per Ss/Map: according to the May 5, 1933 map of M. and J. M. Simmons, who diagrammed and documented the William Moran Family Burial Ground. Click here for a copy of the map. Per RCSG: per or according to Lillian Henderson's Roster of Confederate Soldiers of Georgia 1861-1865 (6 volumes). Hapeville, GA: Longina & Porter, 1959-1964. Cemetery cleaned by Church of Latter Day Saints, and brick graves repaired by Friends of Baldwin Co. Cemeteries in March - May, 2011.
w/o Elisha Moran. All info per Ss/Map. Dates per online genealogies. Per Ss/map. Dates per online genealogies. Age 66. Date and age per obit in Macon Daily Telegraph. d/o Mary Ann and Elisha Moran, per Ss/Map. and others of his family are under wooden shelter, per Ss/Map. No sign of grave shelter now. Some depressions. 1860 census shows Mark's age as 30 years. w/o J. M. Simmons. Per Ss/Map, this person's name is Sallie Moran Simmons with death in 1873, aged 38. Dates, maiden name per online sources. Identity and w/o William Moran, II, per Ss/Map. Dates per online sources. Identity per Ss/Map. d/o James Moran. Per Ss/Map. His body is a few feet to the west from his marker, per Ss/Map. Per Ss/Map. Possibly d/o Wm. & Tempy Moran, per family. Multiple depressions outside fence. Possibly belong to Lattimore Cemetery.